In most everyday decisions we learn about the outcomes of alternative courses of action through experience: a sampling process. Current models of these decisions from experience do not explain how the sample outcomes are used to form a representation of the distribution of outcomes. We overcome this limitation by developing a new and simple model, the Exemplar Confusion (ExCon) model. In a novel experiment, the model predicted participants’ choices and their knowledge of outcome probabilities, when choosing among multiple-outcome gambles in sampling and feedback versions of the task. The model also performed at least as well as other leading choice models when evaluated against benchmark data from the Technion Prediction Tournament. 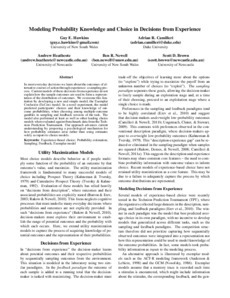 Our approach advances current understanding by proposing a psychological mechanism for how probability estimates arise rather than using estimates solely as inputs to choice models.